Bluebeard (Caryopteris spp. ): growing, planting, caring. 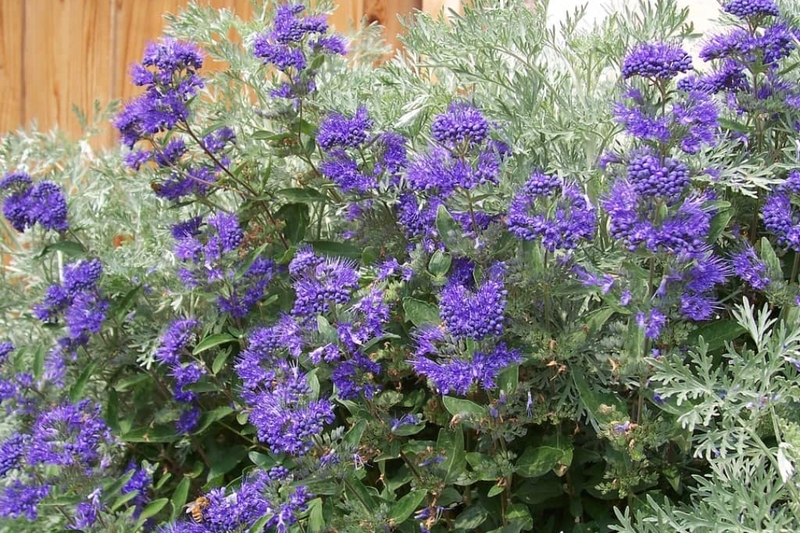 A delicate-scented shrub with lavender-blue flowers. Scientific name : Caryopteris spp. Full description for Caryopteris spp. not yet available. Plant the bluebeard in the spring or fall. Choose a sunny and well drained location in winter (otherwise it may freeze), not too poor. Add compost during the plantation if necessary. Plant every meter in flowerbeds, in a hole twice bigger than the root ball. Do not mix the layers of the soil, you will have to put them bach in the same order. Put some of the soil back in, and adjust your shrub to the right height. When the boundary between roots and stems - the root collar - comes up right at ground level, it is good. Finish filling, tamp well and form a cup around the trunks. Water copiously just after planting. There are two types of watering: in open soil, the first month after planting, water every two days. For potted plants, water twice a week unless the pot is outside and it has rained in the meantime! Feel free to trim your caryopteris every year in March. Mulching bluebeard presents a single risk: if they are in a heavy, wet soil, soil moisture conservation by mulching may weaken them in the winter. Otherwise, mulch without hesitation twice a year, to protect the ground in the winter, and avoid watering and weeding the rest of the year, with straw or shredded wood. In pots, plant in a mixture of compost and light earth, on a bed of gravel. Plan using big pots.